Terrasse à couper le souffle de 350 pieds carrés surplombant la plage ci-dessous et les lumières Mayaguez et les montagnes au loin. Barbecue au gaz, table et chaises d'extérieur avec des vues sans fin. Cuisine ouverte entièrement équipée jouxte un salon confortable donnant sur la terrasse. Confortablement meublé 2 chambres / 1 salle de bain avec lits queen dans chaque chambre. Climatiseurs et ventilateurs de plafond dans chaque chambre. Laveuse / sécheuse dans l'unité avec la télévision par câble et une capacité Wi-Fi. Situé sur la côte ouest de Porto Rico, à seulement 25 minutes de l'aéroport d'Aguadilla, du golf et des casinos de Mayaguez. Maison de vacances idéale pour couple ou petite famille. Plage calme en contrebas, idéale pour nager, faire du kayak, de la plongée en apnée, du paddle board ou tout simplement se détendre avec un bon livre. Marchez vers les restaurants / bars. Plage de surf et autres restaurants, bars, complexe sportif / sportif et place de la ville à 10 minutes en voiture ou moins. Les activités locales comprennent la voile, la plongée sous-marine, le parachute ascensionnel, les croisières au coucher du soleil, les promenades en bateau banane, la location de jet-ski et l'équitation. Excursions à une courte distance en voiture. Il y a des grottes à explorer, des forêts tropicales humides et le plus grand observatoire de radiotélescopes au monde. The pluses were : The unit is clean and well maintained. The neighbors Tony and Sue were very friendly and helpful. The minuses were: There are ocean front houses in front of this property not suggested by pictures posted. There were neighborhood dogs that barked and howled first three and portion of the last nights of our seven day stay. This precluded sound sleep for us, during those nights the dogs barked. The owner of the property addressed this on the nights dogs did not bark. The beach near this property was not suitable for our use; littered with debris and not cleaned. Nearby restaurants at walking distance was a big plus. Easy drive to Rincon and visiting various restaurants, shops, farmer's markets and beaches was a big plus. So sorry, again, about the dogs down the block. I have spoken to the owner again and she assures me she will keep the dogs on the other side of the house. Unfortunately, you came during a week of unusual weather and waves which brought in a lot of debris from the sea. The beach is usually calm and clean but Mother Nature had a different idea for that week bringing in high waves, very rough undercurrent and a much higher tide than normal. I'm happy you found the unit clean and comfortable. Sorry if you misunderstood and thought the beach access was in front of instead of to the side of our building. For that reason, I do not advertise as beachfront although the distance to the beach is less than 100 feet away. I hope you come back to experience beautiful Puerto Rico again and have calmer weather and seas. This condo offered the location we sought at a reasonable price. It was our first time in Rincon. We loved everything about the condo and the area. My husband and I wanted a quiet beach get-away, a respite from the Boston winter. We visited Rincon in early January. 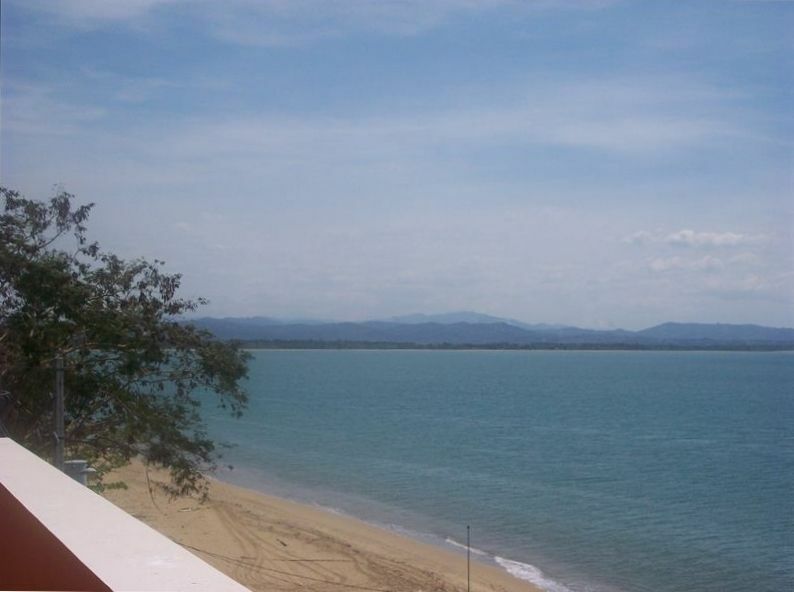 The condo is conveniently located to the beach, our main interest in Rincon. The more popular beaches are 15+min drive away. Luckily, we preferred the closet beach because it was quiet, clean, sandy shoreline with easy swimming access: It felt more like a private beach. If you want to get a snack or beverage, you can use the nearby Rincon beach resort restaurant & bar. They offer a hefty pour and the fish tacos are decent. The unit was about 5-10+ min grocery stores, gas stations, and great restaurants. We recommend watching the sunset at least one night from Picoteo, which is less than a 5 min walk from the unit. The unit was clean and well-maintained with an amazing patio. The condo owner met us when we arrived to walk through the unit and answer any questions. The condo was equipped with everything we may need during a beach stay. It felt like we had a beach home for a few days. The bedrooms and bathroom were a good size. Both were well-maintained and clean. The patio offers an amazing view of the sunset and coast. Our overall stay at this property was excellent. We plan to return again! We had a wonderful visit to Deb and Lou's condo. The terrace was a great place to relax, enjoy a drink and watch the sunset over the ocean! The beach was perfect for swimming and we shared it only with the occasional friendly fisherman. The condo had everything we needed and Debra responded quickly whenever we had a question. The couple in the neighboring unit, Tony and Sue, were awesome! Tony gave me a tour of Rincon on our first day and was very helpful with advice about local restaurants and attractions. We hope to return someday. The BEST vacation rental ever! My husband and I stayed in this condo for eight days, and it was heavenly. The condo is lovely and has everything we needed - even champagne flutes! We had breakfast every morning on the huge terrace, overlooking the sea. It was dreamy:) This area is known for its calm, clear water, which is perfect for swimming. In Rincon the beaches can be rough, which is great for surfers. But if you just want to swim or float, this is the place for you! The Rincon Beach Resort is a short walk down the beach, and they offer a nice lunch menu which you can enjoy in a chaise lounge at the water's edge. We walked there nearly every day. The beds are very comfortable, and the a/c is fast and efficient. The condo is clean and inviting, and everything worked well. We had delicious meals at Tamboo, in Rincon. It's fun to watch the surfers from your table, and the mahi mahi is so fresh - we saw a fisherman bring one into the restaurant as we were eating! We drove to Cabo Roja, which is an easy drive and so beautiful. If you continue to drive to the Light House, which takes you on a dirt road that looks like it's going nowhere, you will be blown away by a secret beach right in front of it; a sparkling blue cove, with caves in the distance - the most magical and romantic place for a picnic and a swim. Deby and Lou are charming and stayed in touch with us during our stay, offering tips and ideas for fun outings. I can't wait to go back, hopefully in the late Spring. Go - you'll love it!! Rates quoted include an e-check discount.